Our vision is that we see ourselves doing good in our local community, for needy international communities, for the environment and to promote peace on our planet, whilst enjoying each other’s company and making a positive difference in our own lives. 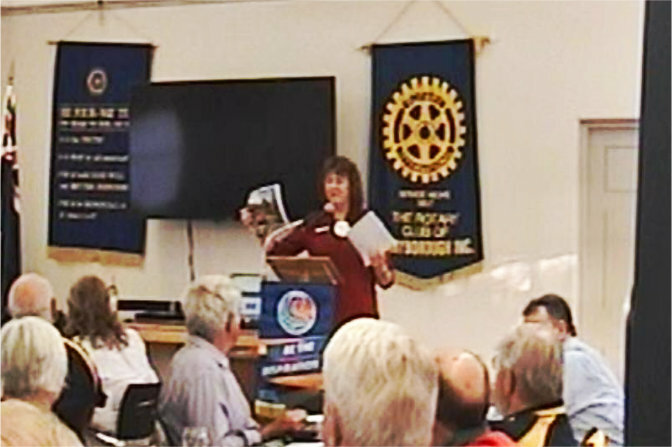 What's Happening at Maryborough Rotary? We thank Graham Farey for updating us all on CPR and the use of a defibrillator last week. His time and expertise were much appreciated. I was also very pleased to receive a posthumous certificate of recognition in honour of PP PHF Bob Osborne from the Shine On Awards. Thank you Thea and Terry for attending the award afternoon on behalf of the club. Thank you also to Thea and her helpers, who have organised and are attending the RYPEN camp at Creswick this weekend. The 25 or more young people attending will receive valuable life and leadership skills. We look forward to hearing, in the near future, from the two students our club sponsored to attend. Please take note that our Service and Governance Committees have been postponed until May 2nd , and that at our meeting on 25th April, we will be completing a very important survey on our club, as a lead in to our new Strategic Plan. Be sure to be there to have your opinions registered. We will be ordering in a meal on that night and will take orders this week. Keep in mind, also, that District Training Assembly is on Sunday 28th April in Ararat. The club pays and names need to be given to Martin asap. I look forward to seeing you at breakfast at Peppa's next Thursday. Stay safe over Easter and inspired. Last Thursday, Manager of St John's Ambulance in Maryborough, Graham Farey, provided members and guests with an important and engaging update on the latest guidelines for saving lives. His first piece of advice was that any emergency assistance is better than none - many untrained people have saved lives. But, it is better to have some knowledge such as the latest version of the acronym for responding to an emergency situation: D.R.S. A.B.C.D. (Danger/ Response/ Send for help/ Airway/ Breathing/ CPR- Mainly Compressions/ Defibrillation). The key difference is that we need to get onto chest compressions as soon as possible if the victim is unresponsive, and if at all possible, use a defibrilator - safely! See the chart by clicking "Read more...". Rotarian Murray was going to propose an International toast to the Rotary Club of Hamburg - the first stop of his recent European tour - but the web site was all in German! 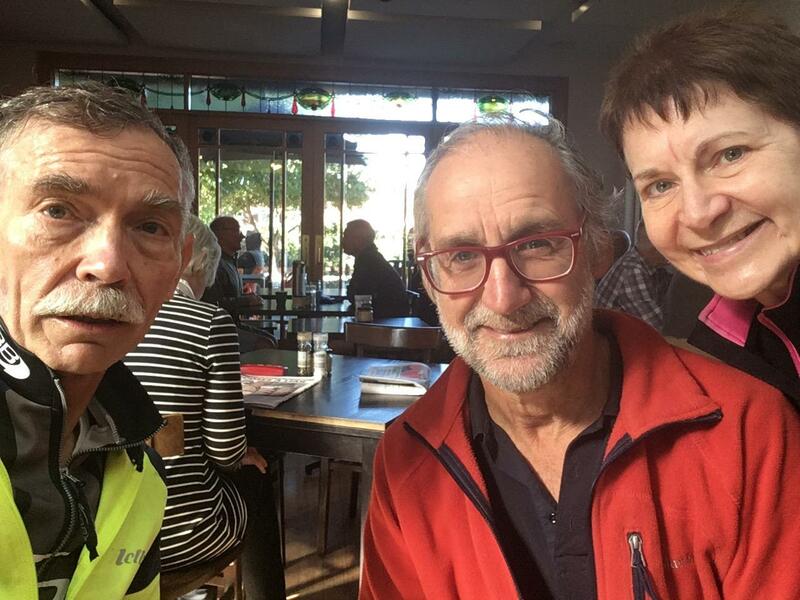 So instead of taking a crash course in the German language, he decided to toast the Rotary club of Launceston in Tasmania - well, it is technically overseas! PP Thea attended the recent Shine On Awards ceremony in Melbourne on behalf of our club. At that ceremony, a posthumous recognition was given to PP Bob Osborne OAM, and a special acknowledgement was presented to our club. PP Thea passed on this certificate to President Meryl at Thursday's meeting. At Thursday's club meeting, PP Garry Higgins OAM shared his recent experience of receiving his OAM regalia from the Governor of Vistoria at Government House. Members were also given the opportunity to see the OAM medals "up close and personal" in their presentation case. At the recent club meeting at the Guides hall, DG Anthony presented Guides CEO, Lyn Curry with a cheque for $500 to say, "Thank You" to the Guides for providing our First Aid presence at the recent District Conference. It was great to see the slideshow of the Conference that Geoff prepared last week. We can look forward to videos as well. Thanks Geoff. Congratulations and thanks again to the Committee and anyone who helped in any way to make the Conference such a success. A special thanks to the wonderful partners and friends for their hard work and support, and to Anthony for giving us the opportunity to "Be the Inspiration". We have had many messages of congratulations from inspired Rotarians! 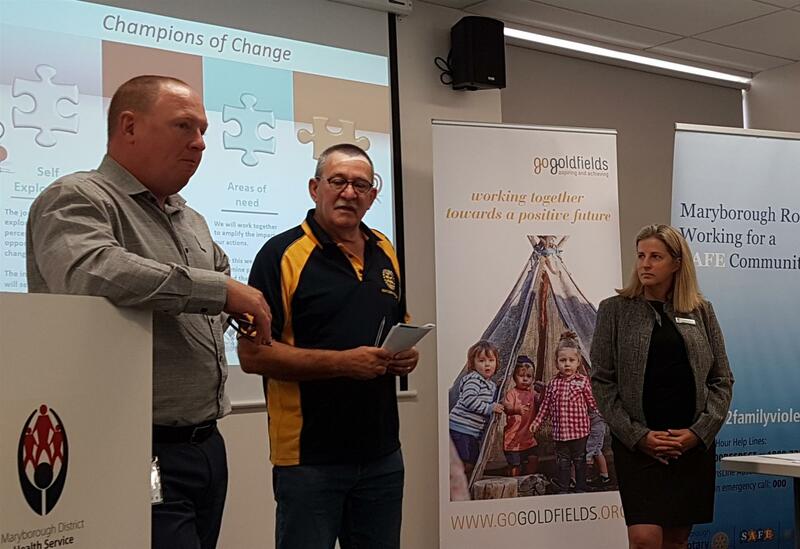 Congratulations to Garry and the Family Violence Committee for the successful Gender Equality Forum they ran with Go Goldfields last week. We continue to be inspired by the work you do. Thanks to Chris and Sue for the great Water and Sanitation monthly page in the Addie. 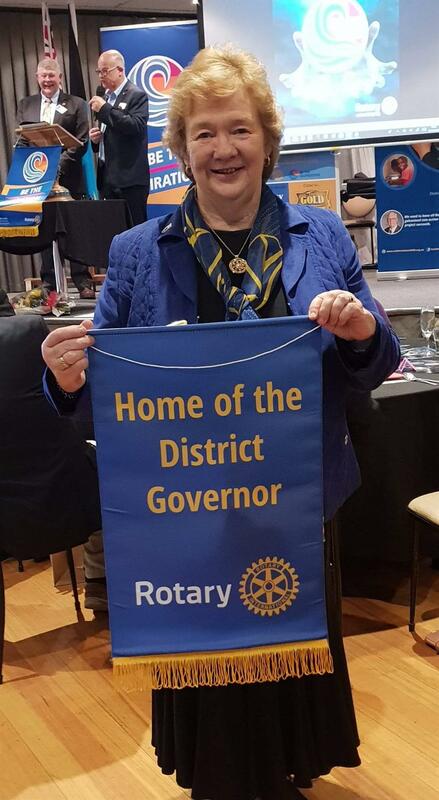 Maryborough Rotary is certainly keeping up its Public Image! Yesterday I had the privilege of being a judge for the District Final of the Lions Youth of the Year. 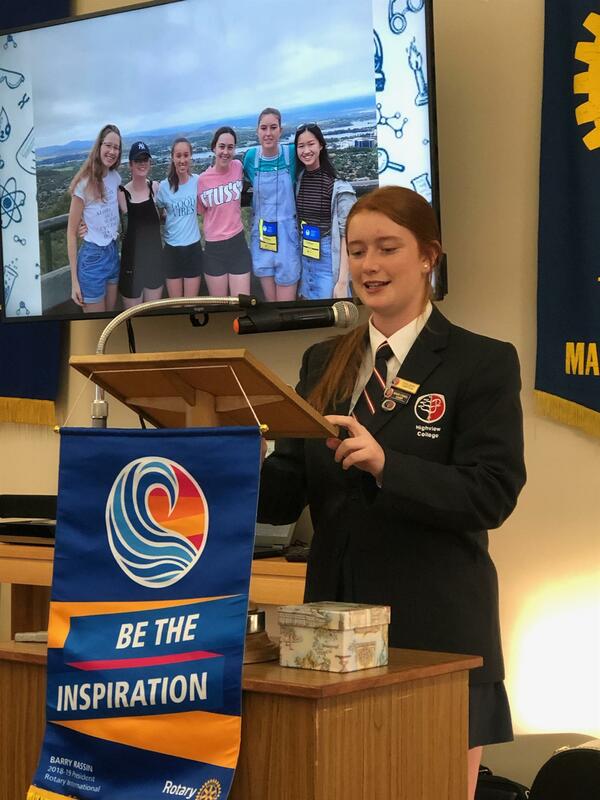 Rotary and Lions have much in common and the five young women certainly exemplified all the qualities we would want to see in our young people. I thank Lions President Lorraine for the opportunity to be part of this wonderful event. Next Thursday we share our meeting with the local Girl Guides and get the opportunity to thank their leaders for their help manning the First Aid table at the Conference. Thankfully they were not called upon to use their skills! Please be sure to let Derrick know numbers for catering. Thank you to the team of members who provided the barbeque for the Maryborough Education Centre Fair on Friday evening. A great community service. Also, could Committee Chairs be sure to get reports to Secretary Derrick by Wednesday, so he can prepare for the Board meeting next Monday. I continue to be inspired by you all! "Our city/town is deeply concerned about the grave threat that nuclear weapons pose to communities throughout the world. We firmly believe that our residents have the right to live in a world free from this threat. Any use of nuclear weapons, whether deliberate or accidental, would have catastrophic, far-reaching and long-lasting consequences for people and the environment. Therefore, we warmly welcome the adoption of the Treaty on the Prohibition of Nuclear Weapons by the United Nations in 2017, and we call on our national government to sign and ratify it without delay." There are easily downloadable linked resources on the ICAN Australia website here for the Australian signatories: www.icanw.org/au/cities/ and here for the international website: nuclearban.org/cities/getinvolved#cities-list. You can see there are a growing number of cities and towns all over Australia and the world joining this appeal, and it is a simple and positive action any citizen can take. I hope these might be of use to you and your members. If I can offer any other information in follow up please don't hesitate to ask. Over 40 representatives from local businesses and organizations attended last week's Gender Equality Forum conducted by the #SayNO committee in our club. This is part of the new phase of education aimed at the prevention of Family Violence. Culture, Living the Values and Flexible Hours are some of the things that companies can work toward to achieve Gender Equality in the work place. Some good questions arose, one being, as most of our staff are women, and the majority of school drop-off and pick-up and child sickness falls on the mother’s shoulders and affect our bottom line! What can we do to make this more even? Pictured are PP Garry and champion of our #SayNO propgram, along with the CEO of Maryborough Health, Terry Welch, and the CEO of the Shire, Lucy Roffey. On Saturday afternoon and evening, President Meryl was part of the judging panel used to judge the District final of Lion's Youth of the Year program. Five very impressive young women from Melbourne, Bendigo, Ballarat, Sunbury and Wedderburn answered very tough questions and spoke about their passions during the evening. It was great to see the local Lions group invite Rotarians to be part of one of their signature programs. A willing and able crew turned up on Thursday night, 21st March to start the process of setting up for this year's Rotary District Conference in the Town Hall and Tren du Bourg Hall - Thank you to everyone for your valued assistance! As well as Service and Governance Committee gatherings, last Thursday's meeting was spent reviewing our club's involvement in last week-end's District Conference here in Maryborough. A slide show of images was shown, whilst District Governor Anthony and President Meryl thanked members for putting their golden hearts into preparing, setting up and running this year's event. Everyone seemed to agree that we could call the conference a "complete success!" Pictured are Rotarian Peter completing, with assistance from Bronwen, their amazing 2000km plus ride around the District, the hall as people gather for the start of one of the sessions, the very successful "Rotary on Show" in full swing, Meryl and Marj just before the Gold Rush Dinner in an impressively decorated Highland Society, and the dessert at the dinner - a delicious, and apt golden heart. Peter and Bronwen Haywood are on their way riding over 2000km around District 9780 and they've already checked in from Ballan, the Fairy Park, Ballarat where they caught up with past Maryborough Rotarian (now Wendouree Breakfast), Trevor Lea, and Torquay - where they caught up with past member, Ray Hannan. Travel safely folks! Click "Read more..." for 10 more pictures of other locations. At Thursday's meeting, PP Mallee Rowe introduced this year's Footy Frenzy competition and already, a number of squares have been purchased. Proceeds from this year's effort will go to a new International project in Sri Lanka. The first stage of this project is to connect electricity to a community hall built back in the post Tsunami days when a group of Maryborough people went there on a working bee to assist recovery efforts. Which way to the Conference? 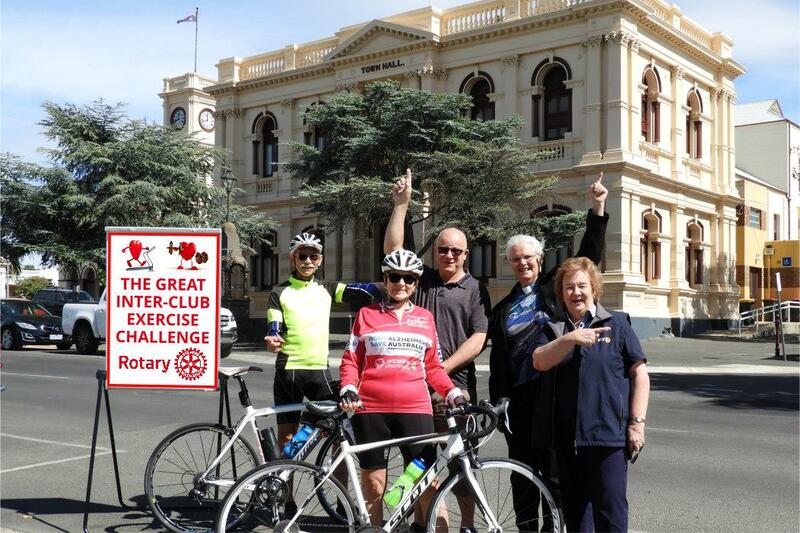 Maryborough Rotarian Peter, and Bronwen Haywood are just about to set off on the Great Inter-Club Exercise Challenge. 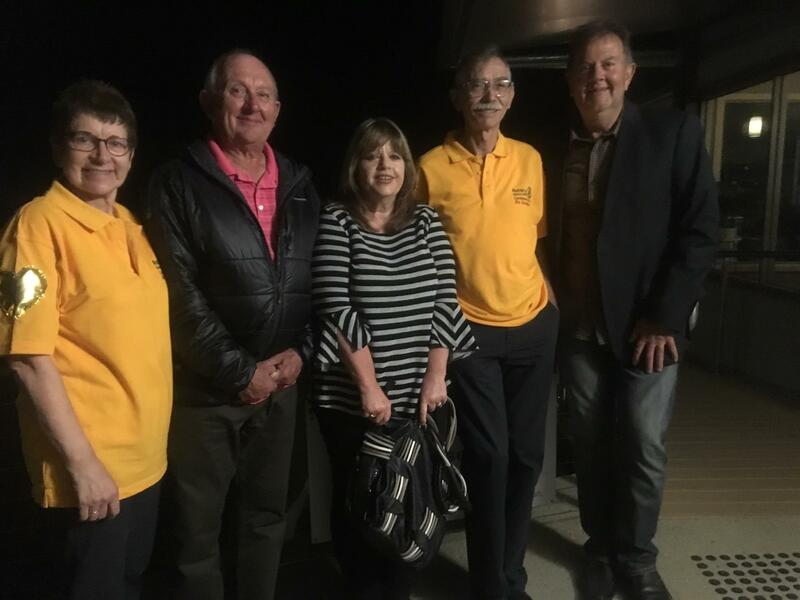 Next Thursday, they set off to travel over 2000 kilometres in the 9 days before the District 9780 Conference to remind all Rotarians of the importance of activity in their lives. The challenge is out to all clubs to keep a record, in hours and minutes of the amount of exercise-level activity their members complete during those same nine days. The activity can be walking, running, bike riding, dancing, skate-boarding, house-work, gardening, in fact anything that gets the heart level raised to at least mild exercise level. The total number of hours in each club will be divided by the number of members to give a score that is to be officially registered at conference. Being Rotarians, we know the estimates will be truthful. We've even had a special trophy commissioned to present to the winning club on the final day of the Conference. Pictured are Peter and Bronwen in front of the Town Hall along with DG Anthony, President Meryl and Past President Heather. If their directions are anything to go by, Peter and Bronwen could end up travelling a long way further than two thousand kilometres! Last Thursday, Highview school captain and Year 12 student, Kate Winkleman provided members with an engaging account of her January visit to the National Youth Science Forum. Kate enjoyed her whole experience thoroughly. She made many like-minded friends from around Australia, and was particularly inspired by a lecture on recent research into the human brain. Kate now has a long term goal of eventually doing similar research to improve the lives of people with a whole range of brain related diseases. This is, of course, exactly what NYSF is meant to do, and it more than justifies our support of this Rotary inspired program. PP Derrick gave the International toast to an Indian Rotary club which is the home club of a friend he made at the recent International Cricketing Fellowship event in Melbourne. He then went on to share the saga of our Club Shed. After we complained about a annual lease for our shed land in the thousands of dollars, the Administrators have come back to us with a much more reasonable annual lease amount of $104. However, there was a clause in the contract that seemed to suggest that after a year, the shed building (which our club built) would become the property of the Shire! Derrick and Rod Brown are continuing meetings with the Administrators to sort this all out and will come back to members with a suggestion once all the facts are known. Watch this space.